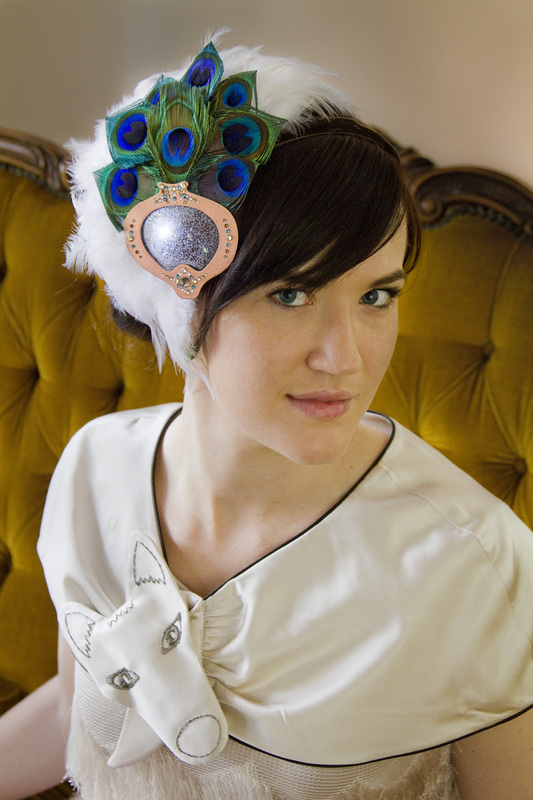 Priscilla and Gavin were commissioned by Andy Dinan of MARS Gallery, to create an electronic piece of wearable art for the Melbourne Cup. Their works were to compliment a 1920?s inspired dress Ms Dinan purchased in Milan. 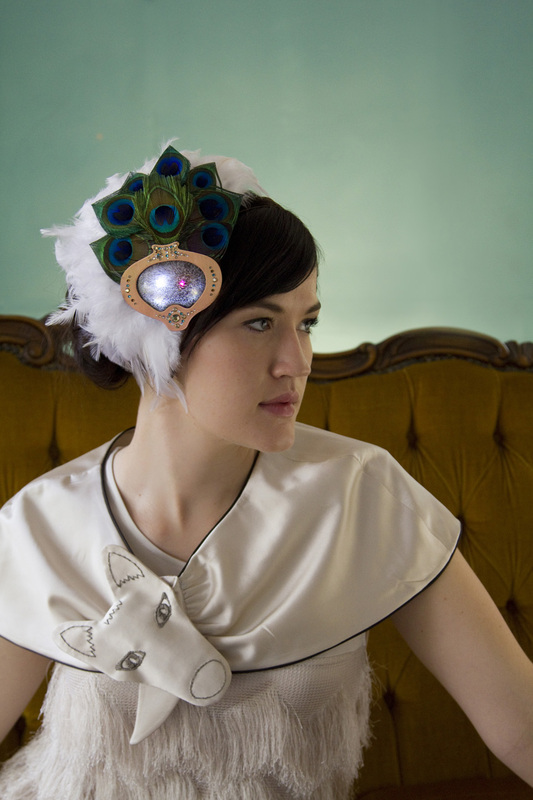 The resulting works are a futuristic twist on art nouveau. Deciding that the dress needed a short shoulder cape, Priscilla teamed up with fashion designer Dean Brough to create a playful interpretation of the ubiquitous ’20?s fox stole. This tailored buff, silk cape with chocolate piping trim, is clasped by a padded silk fox head that is fitted with touch sensors and vibrators. The fox purrs and vibrates when stroked creating a divine sensory experience for the wearer and perhaps a bit of a shock for the curious person invited to touch. Though the overly curious will find that too much touch makes the fox growl. Whilst the fox stole responds to the racing brief in a horse and hound kind of way, Priscilla and Gavin decided to make a head piece with a more direct response to the excitement of race days. 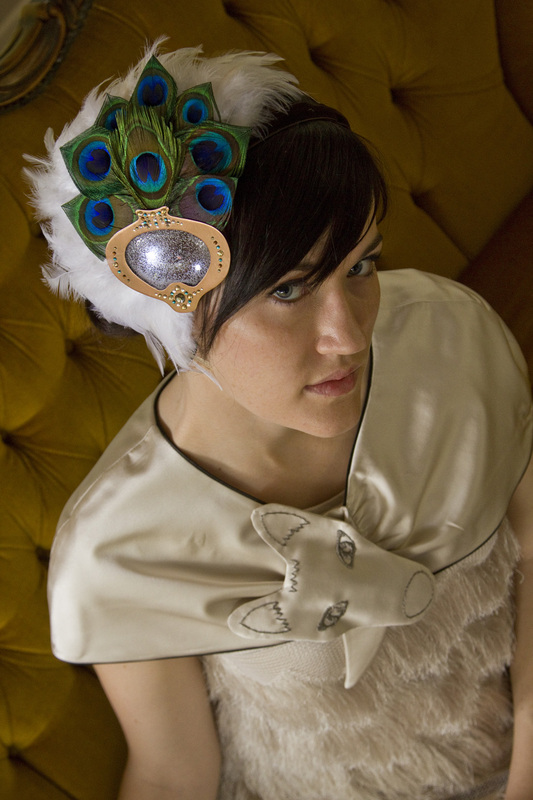 The fascinator features a complex arrangement of peacock and goose feather, clustered around a copper art nouveau jewel. The centre of the piece is encrusted with LED’s diffused by the jewel. These LED’s pulse slowly with Andy’s breath. Hidden beneath the jewel, is a pulse sensor. The LED’s pulse pink when Andy gets excited and her heart rate is elevated. Each of the pieces are neatly packaged with rechargeable battery units sewn into the garments. They are designed to last the entire day, though Andy was warned to take an umbrella in the event of rain.